If you've been itching to take a new adventure but can't seem to take the plunge solo, consider a canine companion as the travel buddy you're looking for. These 36 pups prove that dogs can be just as if not more adventurous than humans. Whether they're a tiny terrier, an energetic collie or a hulking husky, these dogs can keep up with many activities their humans enjoy, from snowboarding and surfing to camping and rock climbing. 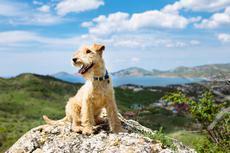 With the right personality, a dog can make the perfect travel companion for whatever trip you have in mind. Check out these amazing adventure dogs for inspiration on what exploring our wide world with your furry friend could look like. Click here for dogs that are definitely more adventurous than you.